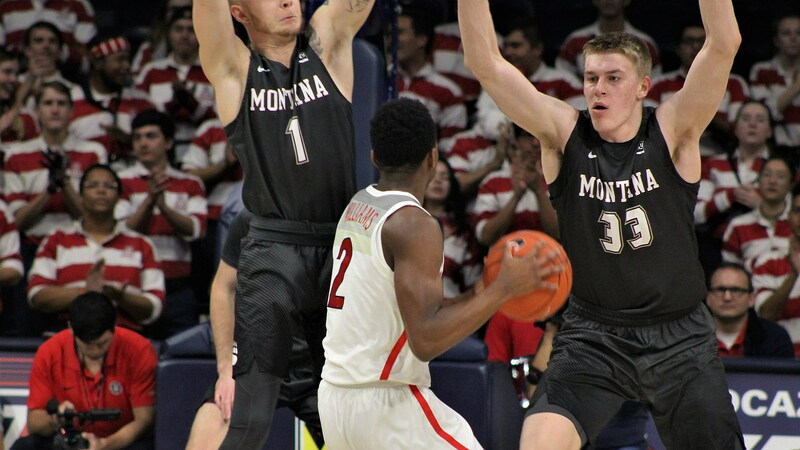 TUCSON, Ariz. – Montana held Arizona to a season-low-tying 22 first-half points, but while the defense was dominant, the Grizzlies couldn’t get their offense going, scoring just 42 points in a 61-42 defeat Wednesday night at the McKale Center. Montana played lock-down defense in the first half, at one point holding the Wildcats without a made basket for more than 10 minutes. During that stretch, Arizona shot 0-for-9 from the floor with six turnovers. The Grizzlies were within two points, 17-15, with 5:15 to play in the first half, but couldn’t score for the remainder of the period, allowing Arizona to build a lead it would keep for the remainder of the night. Seniors Ahmaad Rorie and Michael Oguine combined for 29 points, but one of the main highlights was the play of Kelby Kramer. The freshman replaced senior big man Jamar Akoh in the starting lineup and held his own against Duke transfer and McDonald’s All-American Chase Jeter. Kramer entered the night averaging just 9.4 minutes over seven career games, but played 30 on Wednesday, including all but 43 seconds in the first half. Kramer scored two points while recording three rebounds, one blocked shot and one steal. Arizona improved to 88-4 on its home court dating back to 2013-14, the best winning percentage in the country during that stretch. The 42 points were Montana’s fewest since scoring 34 vs. Syracuse in the 2013 NCAA tournament. Montana shot a season-best 90.0 percent from the charity stripe, making nine of 10 shots. The Grizzlies forced 16 turnovers, including two steals by Timmy Falls. The sophomore also had a career-high five rebounds. Twenty-nine of Montana’s 42 points (69.0 percent) came from seniors Michael Oguine and Ahmaad Rorie. Rorie scored a team-high 19 points, the fourth time as a Grizzly he has scored at least 19 points against a Pac-12 team. Montana was playing without big man Jamar Akoh (wrist), who is averaging 15.0 points and 8.0 rebounds per game in three games this season. As of result, Montana was out-scored 42-16 in the paint. Oguine got into early foul trouble and was limited to 8 minutes in the first half. His 22 minutes overall were his fewest since his sophomore season (Dec. 22 at Pepperdine). The Grizzlies scored the game’s first four points – all from Oguine – before Arizona responded with a 16-3 run. Montana had three separate stretches in which it was held without a made basket for at least 5 minutes.